When something goes wrong with your car, you want it in trusted hands. Thankfully, that’s exactly where your car will be when you bring it to Landmark Chevrolet’s service department! Here’s why our service department stands out above the competition. 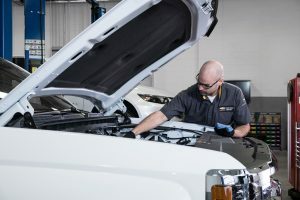 When you take your car to our service department, only Chevrolet certified experts will be working on it. What that means is that all of our technicians go through Chevrolet training before working on a car. No matter what Chevrolet you have, they’ll know it inside and out! If you go to your local body shop, they’ll give your car parts when they need to, but it probably won’t be OEM parts. The benefit of OEM parts is that they’re made specifically for your car’s brand. This means that they’re better quality and will last longer. At our service department, you’ll get all OEM parts. If you have a Chevrolet car, you’ll have a Chevrolet warranty. With a warranty, a lot of service on your car might be covered. But to get service under your warranty, you’ll have to go a trusted Chevrolet Service department (hint – that’s us!). Our service technicians are experts – which means that they can help you with any problem, whether it’s big or small. You can take your car here for an oil change or a tire rotation. Or, you can take your car here for engine problems or suspension issues. We do it all here at Landmark Chevrolet ! When you come to Landmark Chevrolet’s service department in Randolph NY, we’ll build a relationship with you and your car so that we’ll recognize you every time you come in. Knowing your car already can make it easier to pinpoint problems, especially when we know its history.Thinking of coming down? Call Landmark Chevrolet’s Service department today or schedule an appointment online!